The site goes to explain how it will have coverage of Pope Francis and how it is a trusted source for Catholic information. There is a presentation you can watch and another you can download regarding the app. A link is posted telling you how to can sign up and post information. However, what is lacking is information on how to get the application. I found the application in the Google Play store, but it was not easy. 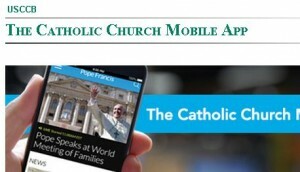 I searched for the “Catholic Church Mobile App” and was given a large choice of apps that were developed by other parties. Finally after some scrolling, I did find an app called “USA Catholic Church” that was developed by the “US Conference of Catholic Bishops.” Further research revealed this was indeed the touted application. Currently, a lot of the features listed above are still in development. Your options in the Android version are “Pope Francis” (news, videos, photos), “News”, “Events”, “Daily Mass Readings”,”Resources,” “Playlist,” and “Settings.” In reading the reviews and the responses, it is quite clear that this application is a work in progress. In my mind, the application was pushed out to help people who where interested in following the Pope while he visits the US to get access to information and to view his addresses and masses. Despite the early release, the features are easy to use and do work. Also the developer is quick to respond to concerns about the application and promise more features over time. As time allows I may provide a more in-depth review. Author CatholicTechnoGeekPosted on September 1, 2015 Categories Geek, star warsLeave a comment on Darth Pooh? The original Star Trek is infamously known for killing members of the crew wearing a red uniform shirt during away missions . The red shirt uniform is commonly associated the security officers on the ship who were like cannon fodder on “away missions.” However, the red shirt was actually worn by support service which included Communications and Engineering. Lt. Uhura as well as the above pictured Mr. Scott are a few of the crew who survived the curse of the red shirt…. Author CatholicTechnoGeekPosted on May 6, 2015 May 6, 2015 Categories Geek, Star TrekTags red shirtLeave a comment on One Tough Red Shirt! 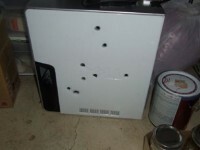 According to “The Smoking Gun” a Colorado man executed his computer by firing 8 shots into it from a 9mm pistol. The reason for the murder was that he was “fed up” constantly dealing with the Blue Screen of Death on the computer and “effectively disabled it,” according to the report. The pistol used had been recently purchased off Craigslist. 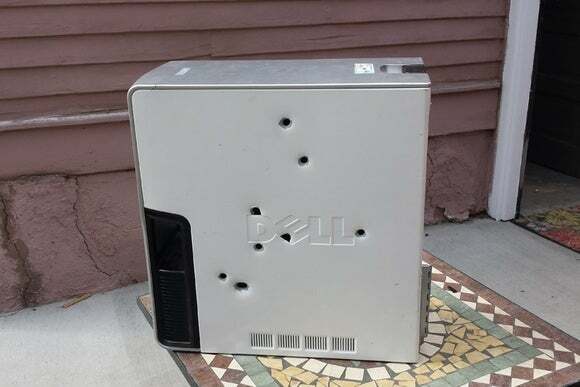 The Colorado Springs police, responding to a shots fired call, found the dead computer on the ground behind the owner’s residence. The computer’s owner admitted to the premeditated killing. The police cited Lucas Hinch with discharging a firearm within city limits and confiscated his gun. However, they left the dead computer at the scene of the crime. ComputerTechnoGeek.com does not recommend this method for curing your computer problems. However, we understand many of us have been driven to the point where we seriously might consider such action. This action cost him a gun and will also cost him time in court as well as a fine. Since he effectively destroyed his computer, he will have to do without or buy a new one. He could have saved money and time have a qualified technician fix the computer, or he could have simply bought a new one. Author CatholicTechnoGeekPosted on April 23, 2015 April 23, 2015 Categories Geek, os, technologyTags BSD, BSODLeave a comment on New Cure for BSOD?